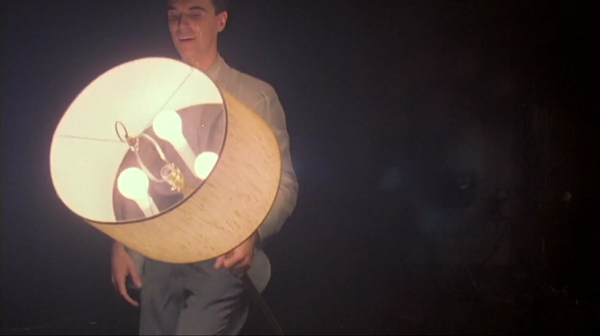 It’s about time I wrote a proper review of Stop Making Sense. I’ve written about it three times before, but always just a brief paragraph. It deserves more than that, especially as a film that has been in my top 100 since I started making that list. I was surprised to see that my last viewing was some 5 years ago. It feels like I saw it last year, but perhaps that’s because the movie is like part of my DNA. There are films you like and films you love… and then there are films you LOVE, films that give and give and give like a doting mother with a bottomless bowl of chicken soup. We cherish our favorite films like precious memories that we can return to again and again to provide us with comfort. They live inside us afterwards, or maybe they surround us like a warm haze or a cozy blanket. But maybe I should stop gushing and using sloppy metaphors. To describe what the movie is and what makes it great, perhaps I’ll save myself some time and condense some comments from my previous mini-reviews. There’s no interviews, no behind-the-scenes footage, no fans, no animation, no fantasy sequences. Just 9 musicians and their instruments, a floor lamp, and a big suit. With these sparse tools, Demme and Byrne crafted the finest performance film I’ve ever seen. There’s a reason this movie played every weekend for 2 years at the Fine Arts Theater in Chicago… it’s engaging, energetic, and completely infectious. Through variations in lighting, staging and dance, they manage to give every song a distinct visual feel. The personalities of the band members shine through, and all involved seem to be having tremendous fun. It’s rare for a concert movie to contain so many memorable moments. Well, that was easy. Nothing like recycling. But what else can I add? I left out my nitpicks, which are not negligible but we love our favorite films the way we love our families… we accept them as they are, flaws and all. Is it annoying that Chris Frantz says “Check it out!” like five times during the “Genius of Love” performance? Of course it is, but he’s still a huggable teddy bear with an adorable grin on his face (it’s cute to catch Tina Weymouth — his wife — looking back and smiling at him). The way the film builds is really something. It starts with the barest simplicity, just Byrne and a guitar and a boombox on an empty stage. And with each successive song, more elements are brought in and it starts to become a production. It would be stretching the truth to claim that a story is being told, but there is a development of mood. Eventually the tone gets stranger and less personal, and in a way the movie lures us down the rabbit hole. After the vigorous calisthenics of “Life During Wartime”, things start getting a little out there with the enigmatic Big Brother-esque screen projections of “Making Flippy Floppy”. There are dark moments, like Byrne’s fascist bayou spokesman of “Swamp” or the faces distorted by shadow in “What a Day That Was”. Then there is a moment of rest, albeit one in a surreal, lamp-lit environment. Is there a sweeter lullaby than “This Must Be the Place”? Not to me, there isn’t, nor is there a catchier one. “Never for money/Always for love/Cover up and say goodnight”. But it’s only a breather because here comes the jittery, self-destructive paranoia of “Once in a Lifetime”, a disorienting change with “Genius of Love” and then “Girlfriend is Better” and the otherworldly image of The Big Suit, the film’s most iconic image. It’s an outfit that evokes Japanese Noh theater, comments on corporate society, and looks really funny when you dance in it. Jonathan Demme and Talking Heads take us through a bizarre tunnel and guide us through to the other side. After “Take Me to the River”, we’ve all gone through a baptism of sorts, with Byrne our oddball, anxious messiah, and our comrades dance in the aisles, overcome with rapture. Reborn through music. Music that’s seriously, seriously good. This entry was posted on September 12, 2014 at 1:10 pm	and is filed under Movie Reviews. You can follow any responses to this entry through the RSS 2.0 feed. You can leave a response, or trackback from your own site. Great review Martin. I also really like this film (if not quite LOVE it on your level) and your review makes me want to put it on immediately, perhaps the biggest compliment I can think of. I think my favorite movie reviews tend to be where people write about their true favorites. I think that’s also why I always enjoy browsing people’s top 100 lists. It gives you an insight not only into their tastes, but also into who they are. There’s little I enjoy more than putting on a movie that’s an old favorite and spending a couple of hours with it. It’s truly like spending time with an old friend. They absolutely provide us with comfort and live inside us. Thanks Evan! The easiest reviews to write are glowing ones and harsh ones. Everything in between is something of a struggle.